The reverse proxy logs contain time, source IP and web site information about requests made using the reverse proxy service. • Go to Reports > Logs > Reverse proxy. • Time — The time the web request was made. • Source IP — The source IP address the web request originated from. • Website — The URL of the requested web resource. 1. Go to Reports > Logs > Reverse proxy. • Year — From the drop-down list, choose the year’s data to export. • Ignore filter — Enter a regular expression that excludes matching log entries. • Enable ignore filter — Select to enable the ignore filter. • Domain filter — Used to display log entries recorded against a particular domain. Matching will occur on the start of the domain part of the URL. For example, www.abc will match www.abc.com and www.abc.net but not match abc.net. It is possible to include regular expressions within the filter — for example (www. )?abc.com will match both abc.com and www.abc.com. • Enable domain filter — Select to enable the domain filter. Note: When running SSL VPNs in TCP mode, the reverse proxy access logs generated for HTTPS requests will contain a source address of 127.0.0.1. This is because OpenVPN has to proxy the HTTPS traffic. 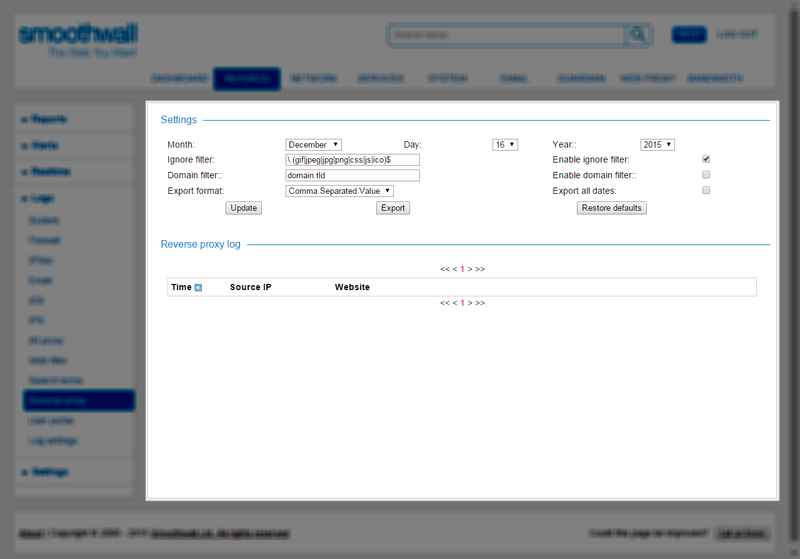 Therefore, from the Smoothwall’s point of view, the traffic is originating from localhost. You can also choose to export reverse proxy logs to a chosen format.